Even though Moira Brown doesn't travel the wastes to research the guide, she is quite the traveller herself. She arrived in Megaton from the Canterbury Commons under mysterious circumstances before 2263. Additionally, if you choose to detonate the unexploded nuclear bomb in Megaton as part of the quest “The Power of the Atom”, she will travel hundreds of miles across the wastes to the ghoul city of Underworld, deep within dangerous, super mutant-controlled Washington D.C. It is possible to continue the Wasteland Survival Guide from there. However, if the Wasteland Survival Guide quest has been completed, she will stay near the entrance to the Megaton ruins, and will only be able to repair equipment. 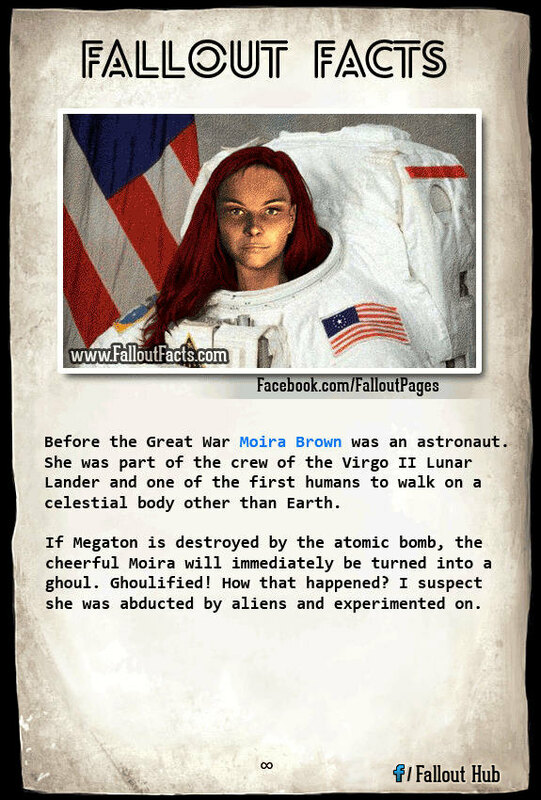 Did I mention that if Megaton is destroyed by the atomic bomb, the cheerful Moira will be turned into... a ghoul? Ghoulified! How that happened? Well, I suspect she was abducted by aliens and experimented on. There's no other explanation for her sudden ghoulification, is there? Moira Brown can repair weapons and armor, to a maximum of 72% throughout gameplay. She also has a large and varied inventory to buy, sell, and trade. She is one of the first to offer you schematics for weapons such as the Rock-it Launcher and the Dart Gun. By far the best weapon one can get from interacting with Moira is the Repellent stick (makes Molerat heads explode in a gooey green mess).